Burgundy is beautiful all year round. Everybody knows that. But August, the month before Harvest, the quiet before the storm, is when Burgundy truly bristles and brims with vitality and energy. If you really want to know when the best time is to come and be bewitched by Burgundy and Pommard… the time is NOW! 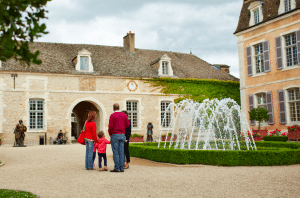 Just in case you need more proof, here’s 11 reasons to visit Château de Pommard this August. 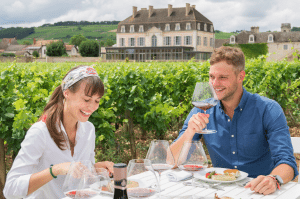 Located close to the center of the Côte d’Or, Château de Pommard and Clos Marey-Monge spend a great deal of the year sun-tanning in superb weather conditions. In Burgundy, the average August temperatures ascend to 78°F (26°C) but, obviously, can go much higher. The region is famed for its Goldilocks approach to weather, where a fusion of Oceanic and Semi-Continental climates come together to make everything just right, the ultimate playground for winemaking and good times. And, of course, none of that’s possible without the persistent presence of the Sun who, during August, comes out to play for a rather pleasing seven hours a day. Before thousands of Starlings pick the remaining grapes from the vines after September’s harvest, August is the final month of the year to pull up a pew and watch the grapes that hang from 200,000 vines grow up to a fruity maturity. 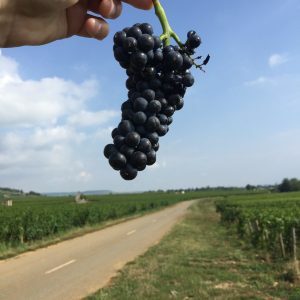 Yes, in August, Véraison nears completion; the Pinot Noir grapes have finally transformed from green to purple, and are now on their final, crucial journey: finding the sweet-spot between sugar and acidity. In August, Summer Holidays are in full swing, the time of the year when much of the world takes time off to spend time on the family. Naturally, it’s the best time to pack up the car with picnic blankets, place your bikes on the rack and take your best friends and family to a place where time, stress and the duties of daily life are not allowed in. 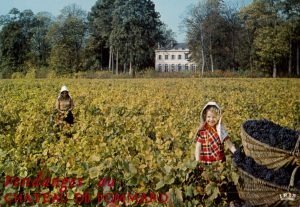 With more than 20 hectares of vines to run around in, and an exclusive selection of fruity organic syrups to provide the energy, Château de Pommard is the perfect playground for families too! Winemaking is a year-long endurance race, where every day adds something new and challenging into the mix. Château de Pommard is a hard-working vineyard, busy with many teams from different departments coming together to create something special. On any given August day, tractorists will be sitting pretty above the vines giving them a trim and tending to the terroir, vineyard workers will be tidying the vines and preparing the cuverie for Harvest, winemakers will be tasting fresh juice from the oak barrels and sommeliers and wine advisors are open visitors eyes to blind tastings on one of our six Wine Experiences. 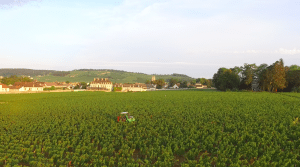 At Château de Pommard, we work hard to make sure our wines are easy to taste! There is nothing better than a chilled glass of Rosé on a hot Summer’s day. For our first music, food and wine festival, Rootstock, our winemaker Emmanuel produced a very exclusive 2016 vintage of Rosé. Suffice to say, it’s gorgeous. We have a few – very few! – bottles left and should you travel from your own home to ours to taste it we can guarantee it would not be a wasted trip. Light, crispy, refreshing, and incredibly quaffable, our Rootstock Rosé is the true taste of Summer. 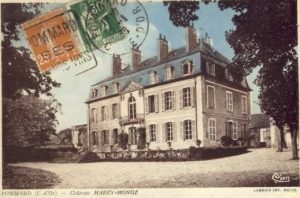 Château de Pommard’s 20-ha vineyard Clos Marey-Monge is now one of the 1,724 UNESCO World Heritage protected Burgundy climats. 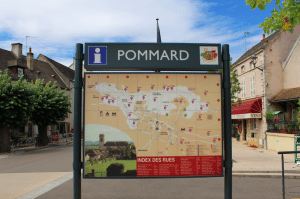 With seven terroir all under one monopole, a genuine Burgundian curiosity, Château de Pommard is ideal for those aspiring Côte d’Or connoisseurs who are looking for a bit of variety and wow-factor in their Burgundy adventure. 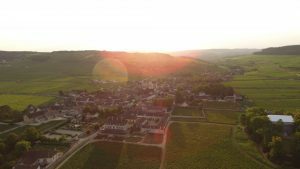 In 2017, the Route des Grands Crus celebrated its 80th birthday. The whole region was invited to the birthday party and enjoyed Les Mois des Climats. A month-long celebration of the cherished and historic wine road. At the heart of the celebration was Château de Pommard. 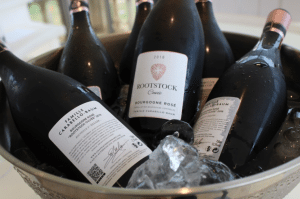 We hosted a food, music and wine festival, Rootstock, as well as other exciting tasting events. The Route des Grands Crus runs right behind our back garden, so it is very special to us. We share the same history. We share the same future. 8. Sitting in the back Garden. Our back garden! Everybody agrees that August is the best time of the year to sit back, relax and sip back a glass of cool, crisp, refreshing wine. The best location to do this, of course, is your own back garden. Your very own place of peace and garden of zen. 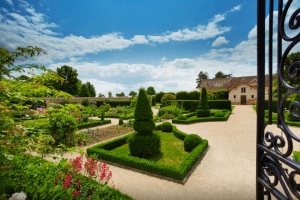 Well, should you fancy an even more relaxing change of pace to your scenery, our 18th century Jardin á la Francaise is the ideal spot to clear your mind and enrich your soul. Located across the other side of Rue Marey-Monge, which follows a south-flowing stream, Jardin á la Francaise is manicured to perfection. Trees are pruned into goblet shapes. Naturally, a technicolor kaleidoscope of flowers in bloom eradicate any blues and the octagonal pool is pure perfection for those seeking long moments of reflection. We always say that Burgundy is never the same twice. The tourist maxim ‘Been There, Done That, Bought The T-Shirt’ simply doesn’t apply to Burgundy. Every visit is different. Every year is different. 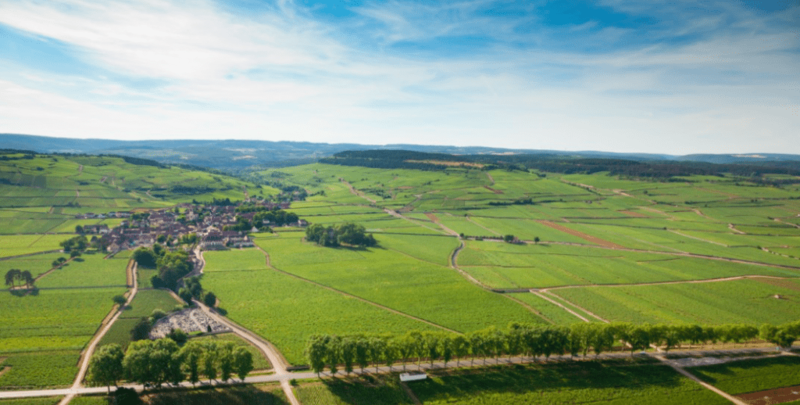 If you come to Burgundy in August, we can guarantee by the end of your journey, you’ll have already booked your next trip. And you won’t want to miss our Harvest Experience … in September! 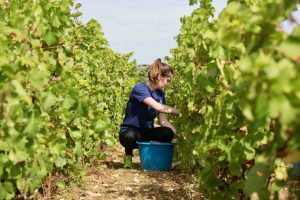 For the second year running, we are launching our Harvest, or Vendanges, Experience. If August is the quiet month before the storm, and you’re looking for the storm, then September’s Harvest is just what you’re looking for. You can book your Harvest Experience now ! The Harvest Experience is thirsty work, so make sure you get plenty of rest in August. Just because school is out in August, it doesn’t mean that the family have to stop learning. Château de Pommard is a History, Geography, Science, Technology, Art, PE and French lesson all rolled into one. From the bottom of the underground cellar floor to the ceilings of our two stately châteaux, to the Clos wall that binds it all together – around every corner and curve – Château de Pommard is pure enlightenment. As the former Summer holiday of Napoleon Bonaparte ; the emperor resided in Château Marey-Monge in the early 19th century ; the family home to important Burgundian dynasties and even the home to a very large Arabian horse (now buried somewhere in Clos Marey-Monge), our house is a great way to stay educated during the Summer school-free months! Go back to the future with Our History. Of course, the wine. And what fine wine it is! Feel the seductive curves of our new bottle design and swirl, sip and swig the true taste of Burgundy. In our brand new Tasting Room – our dedicated spot for trying out any wine you like – and the perfect place to conclude your exhausting and insightful walk-and-talk Wine Experience. 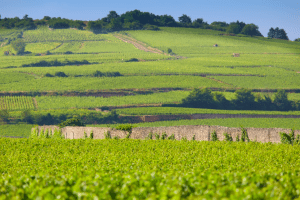 Our highly-rated and acclaimed Clos wines – Vivant Micault, Clos Marey-Monge Monopole and Simone – and our Family wines (from several Côte de Nuits and Côte de Beaune appellations) are your refreshing weapons of choice to combat the Summer heat and make it through the long hot August nights.